Enrollment growth stable. 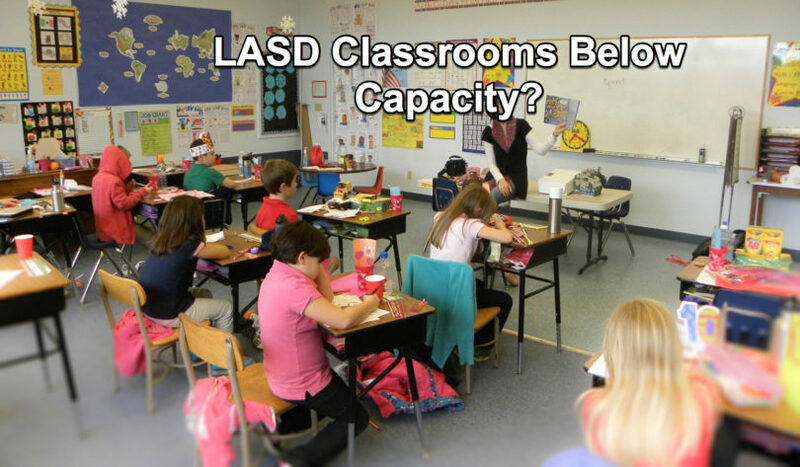 LASD classrooms have capacity now, may have more over time. Her “medium” forecast is for STABLE enrollment. Only actual planned new housing projects are included, not prospective housing projects. If BCS grows by 300 students as it plans, LASD will have reduced enrollment of 300. 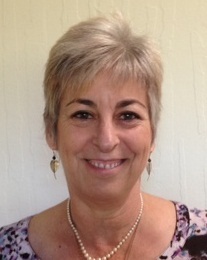 The demographer says that as BCS grows, LASD shrinks, pretty much 1:1. 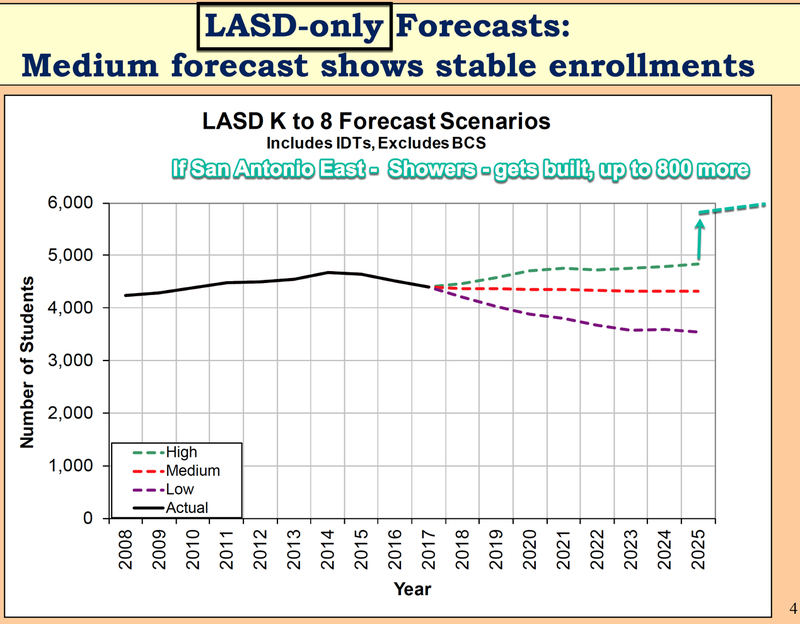 On the previous graph, you can see that LASD only medium forecast is below capacity of 4800. On this graph with BCS enrollment you can see the total system exceeds target capacity. And BCS has absorbed all of that enrollment in its two 100% portables facilities. LASD and BCS together serve about 800 NEC students right now. This is two neighborhood schools, not one! 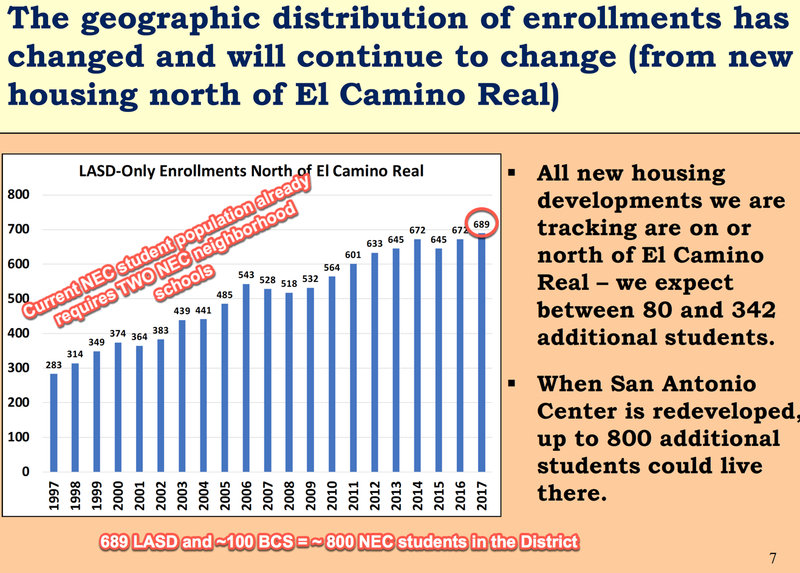 Lalah’s back of envelop calculations suggest that LASD enrollment is 14% NEC, while BCS enrollment is 8.5% NEC. BCS in the past has attributed this to the fact LASD does not want to do joint kindergarten registration outreach. 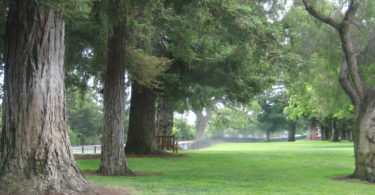 Lalahpolitio: So consider the 10th site – 8.6 acre Old Mill/ Safeway – in Mountain View. It could be a NEC neighborhood school with 800 now… to as many as 1100/1600 NEC students by 2025+? It could be a BCS school with 850 now… to 1200 students by 2025+. The only existing LASD schools serving that kind of massive enrollment are the 15 acre+ junior high schools. Cramming this many students on that little 8.6 acres of land land is shockingly below the district norms. So just one NEC school for all NEC students is impossible or at least undesirable given our standards. Others have proposed that the students in NEC-Palo Alto [west of San Antonio] continue to attend Santa Rita school. The rest of NEC [ perhaps 400 to 500 students ] could attend a new neighborhood school at Old Mill/ Safeway. LASD staff are arguing Old Mill/Safeway is best for BCS. They are arguing that keeping LASD’s NEC students – some of which are from lower socioeconomic families – split into 3 groups and mixed in with preponderantly privileged[?] kids at LASD’s Covington, Almond, and Santa Rita schools is good for those less-advantaged students. Lalahpolitco: Well if that is good, perhaps even better is to split them into 7 groups and assign them to all 7 LASD elementary schools. Let’s subsidize the bussing. Perhaps let the families chose which school to attend – constrained by space availability like in Saratoga. Maybe a parent who lives in NEC – P.A. and works at El Camino Hospital on Grant Road and would like his child to attend Oak! 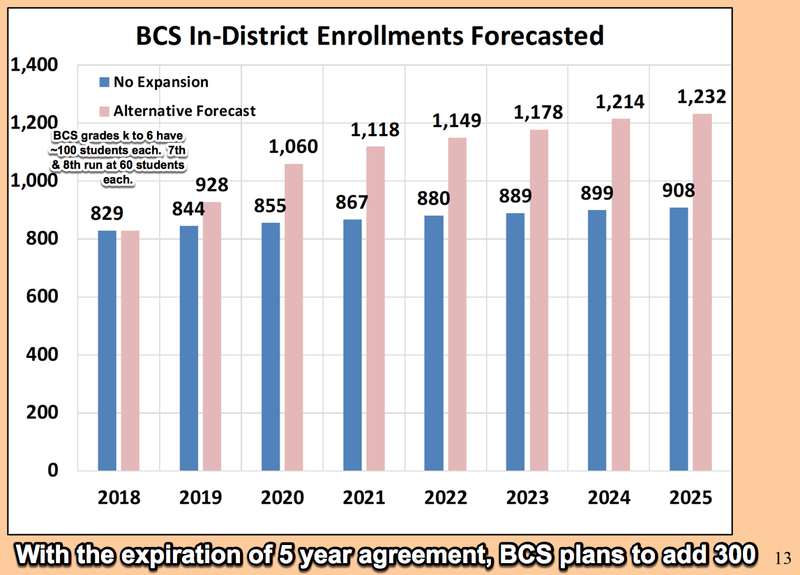 BCS has been running below its 5-year agreement enrollment cap of 900 students. Grades 7 and 8 run at 60 or so students, while all the other younger strands run maxed out around 100 and a bit. 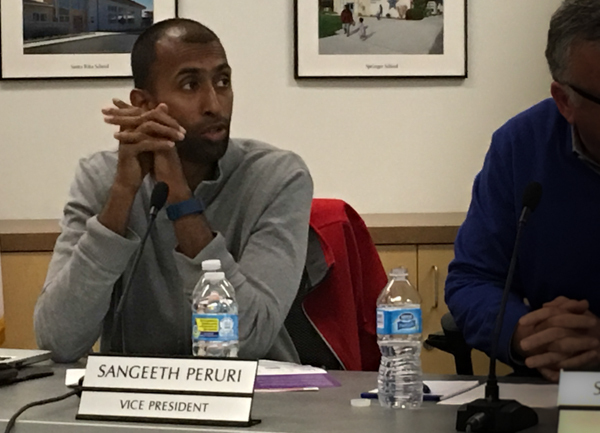 LASD Trustee Sangeeth Peruri asked “Why?” The demographer had no answer. Lalahpolitico: Lot’s of reasons I suppose. Perhaps parents begin to decide if the graduating BCS 6th grader is going to be going to MVLA, or if the child should enter a private prep school in 7th grade to get a spot. I suspect a significant fraction of BCS 6th grade students destined for MVLA high schools decide to enroll at Egan and Blach for 7th and 8th, for social and other reasons. 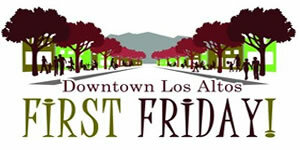 I hear of many families with some kids at BCS and some kids at LASD. 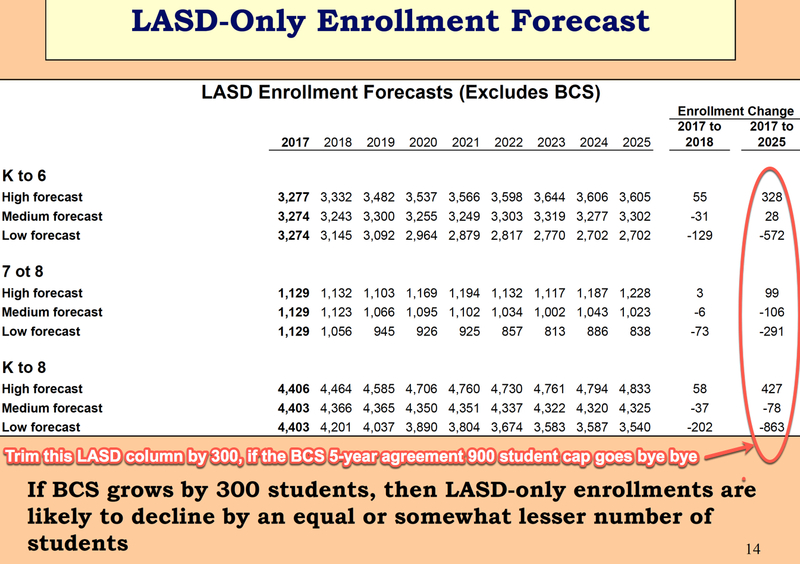 The demographer said that if LASD enrollment goes up by the 300, then the forecast column needs to shrink by 300. In other words, in the “medium” LASD k-6 forecast, LASD enrollment will shrink and there will be space at the seven k-6 schools in the district. With the expiration of the 5-year agreement, BCS plans to grow by 300 students. BCS folks say it has around 800 students on its waiting list, so it seems reasonable to assume they WILL GROW. 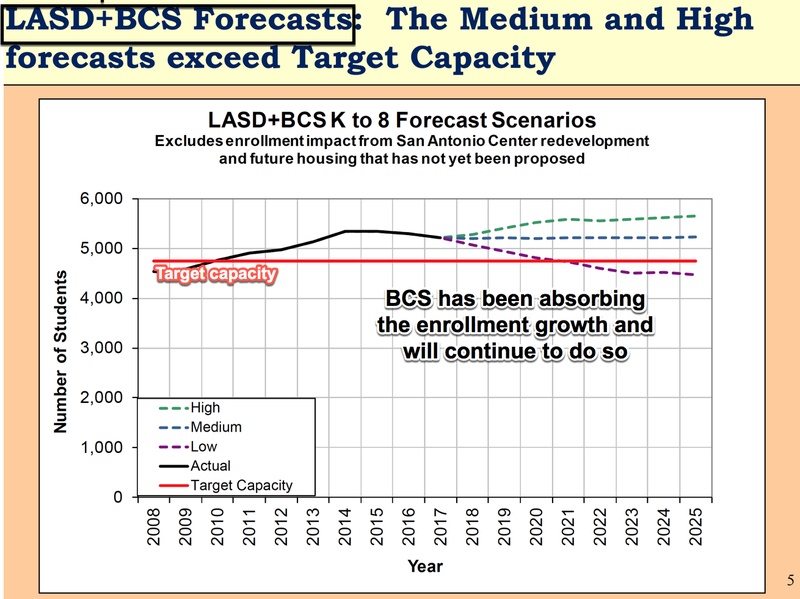 The demographers said, if BCS grows, that will depress LASD enrollment virtually 1:1. Enrollment will shrink at the seven k-6 LASD schools, leaving room for students which may arrive beyond the timeline of this forecast. 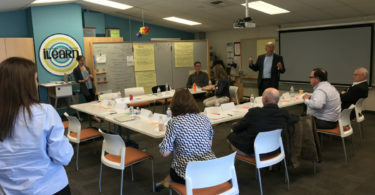 After using Lapkoff’s previous Enrollment forecasts in 2014 and 2015 to motivate the public to vote for the $150 million Measure N bond…to solve the “Enrollment Growth” problem, Trustee Peruri now says he is going to ignore this forecast. 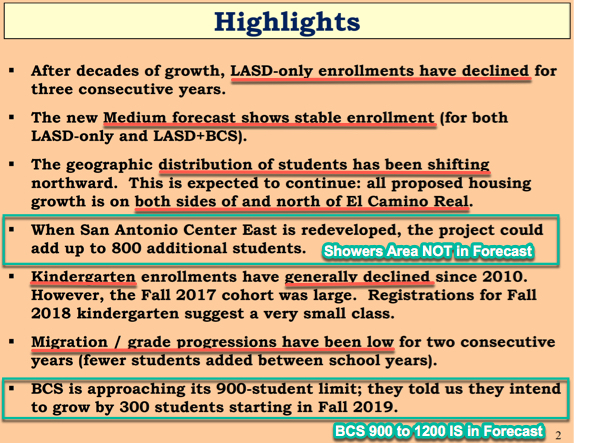 It was a Demographer LASD Enrollment Forecast of collapsing enrollment in the 1970’s that lead earlier boards to Trustees to make the mistake of selling off 3 school sites. The demographer agreed with Peruri, it would have been better to rent out the sites. Look at the history of 100 years, or of a very long time. It was the in the 80’s and 90’s that the apartments west of San Antonio were built. There were not many families then. It took decades for them to age and become naturally occurring affordable housing. That’s when we got the spurt in students. Instead of a Demographer LASD Enrollment Forecast, Peruri says he needs a 30+-year housing forecast, based on long-term real estate projections. 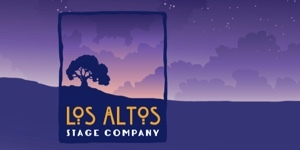 He is sure that over 30 years, one can envision all the the area’s parcels – Sprouts/CVS, Village Court, Showers Drive, El Camino Los Altos – all converting to more housing. Paraphrasing Peruri, clearly, very long term, it makes sense to acquire land now. The demographer did not disagree. Lalahpolitico: Evidence-based decision making? Forget about it. 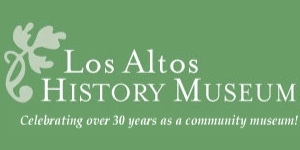 It’s about LASD-City of Los Altos parent privilege.